I've been holding on to this one for a while now, and I was going to wait to launch it when the new blog goes live but I just couldn't wait any longer. 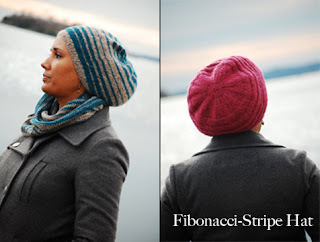 I'm excited to introduce my Fibonacci-Stripe Collection! Starting with the Neck-Warmer/Cowl pattern. 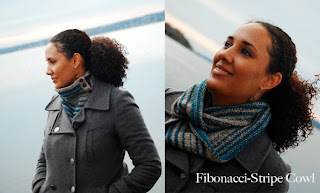 This is the updated version of my original Fibonacci Cowl pattern, which pulled over the head and fit close to the neck. As anyone with long, thick or curly hair knows…pulling anything over the head causes hair to become wild and out of control. My solution…knit a neck-warmer that buttons up the side, and/or a cowl that can be worn loose or worn doubled to keep the wind at bay (and the hair looking neat). The pattern includes both the neck-warmer and the cowl, in either two-color Fibonacci stripe, or one-color textured stripe variations. The close-fitting neck-warmer uses six buttons (but could be knit in the round without buttons if you prefer), and uses two 50g balls of Berroco Blackstone Tweed or any aran weight yarn of at least 130yds. The longer cowl uses three balls of Blackstone Tweed for the one-color texture stripe version, and four balls for the two-color stripe version. Next up: The Slouchy Hat! For the hat, I wanted to knit something that would be pretty and warm, and would also be capable of fitting all of my hair into it when the weather takes a turn for the worst without wrecking my hair for the rest of the day. Any of you girls out there with curly hair know what I’m talking about, and this hat is for you! (I’m happy to say that after field-testing this in New England winter weather, it’s just what I hoped it would be.) The pattern offers two sizes, two different depths, and one-color textural striping or two-color striping. It is worked in the round, and uses “bulls-eye” decreases to accentuate the Fibonacci striping. The hat uses two 50g balls of Berroco Blackstone Tweed, or any aran weight yarn of at least 130yds. And my personal favorite: the Convertible Mittens :) These convertible mittens are the most practical, warm, soft, and all-around best mittens I’ve ever designed or worn. They provide quick access to your fingers when you need them, and the ability to quickly tuck them away when you don’t. The pattern provides two sizes, with options for two-color stripes or one-color texture striping, flip tops or traditional mittens, and optional “texter-thumbs”. It is easily adjustable for length (great for tall knitters! ), and the extra-long cuffs keep the wind out of coat sleeves. The flaps are worked as a continuation of the mitten, in one piece with short-row shaping, and they lay flat against the back of the hand when not in use. No buttons necessary, so no silly little button loops at the tip of your hand (and no How-The-Grinch-Stole-Christmas-hands when you wear them closed). The mittens use two 50g balls of Berroco Blackstone Tweed, or any aran weight yarn of at least 130yds. The patterns are all available for individually sale, and will be released soon as a collection in e-book format. Customers who purchase an individual pattern but would like to purchase the e-book, will be able to deduct the the price of that pattern from the cost of the collection at checkout. What a wonderful collection...I love stripes so much!